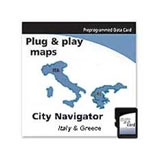 MicroSD memory card, City Navigator NT, Italy. Contains full detailed coverage of Italy and Athens, Greece including motorways, national and regional thoroughfares and local roads. Contains navigational features such as turn restrictions and speed categories. Points of interest such as: food and drink, lodging, border crossings, petrol stations, hospitals and more. Will automatically create point-to-point routes on your NT compatible Garmin GPS.